This porcelain pillow is in the shape of the “ju-i” symbol. High at the back and sloping down towards the front, the top of the pillow is slightly indented towards the center. 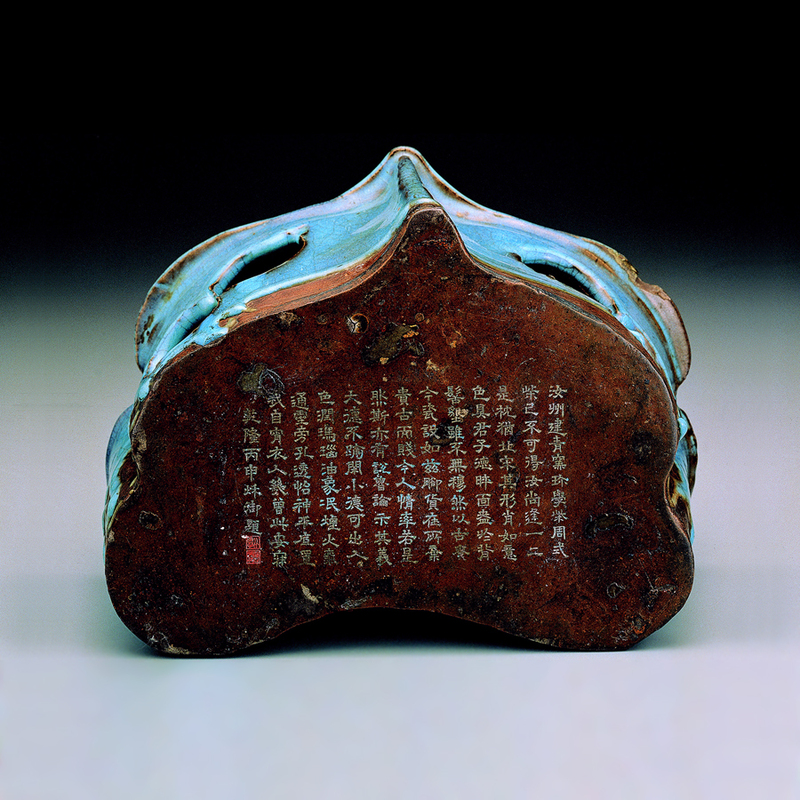 It has a flat base on which a poem written by the Ch’ien-lung Emperor in 1776 is inscribed. Both sides of the pillow have gourd-shaped holes, revealing a hollow inside and thick walls. The whole piece is covered in a thick sky-blue glaze extending down to, but not quite reaching, the base, with glaze “tear-drops” near the bottom where the thick glaze has run during the firing process. In places where the glaze is thin on the corners and around the rim, the brown color of the ceramic body under the glaze can be seen. 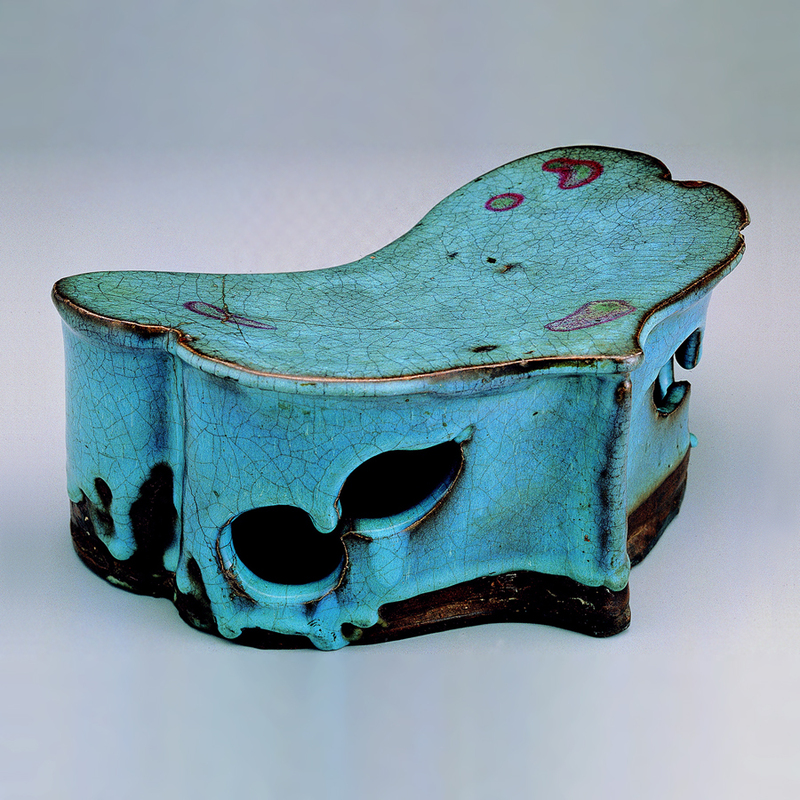 The surface of the glaze exhibits crackling, with purple-red spots appearing on the sky-blue glaze due to the addition of a copper-red glaze, adding a naturalistic aesthetic. There are also very clear examples of “palm eyes” often seen on Chün ware, which again reveal the color of the body under the glaze. This type of “ju-i” shaped pillow was already seen during the Sung dynasty (960-1279), with extant tri-color “san-ts’ai” pieces as well as white-glazed pieces incised with floral designs. The Ch’ien-lung Emperor (r. 1736-1795) commented that this piece “appears to be from the Northern Sung”, but this is probably more from his liking of ancient things. In fact, when compared to examples dating from the Sung still extant today, this particular piece is simpler in design and decoration, and distinctly shows the corners of the pillow. Also, this pillow is slightly more elongated in width, and shorter lengthwise, making it slightly squarer in shape. All of these conform more to the Yüan dynasty style of ceramic pillow.